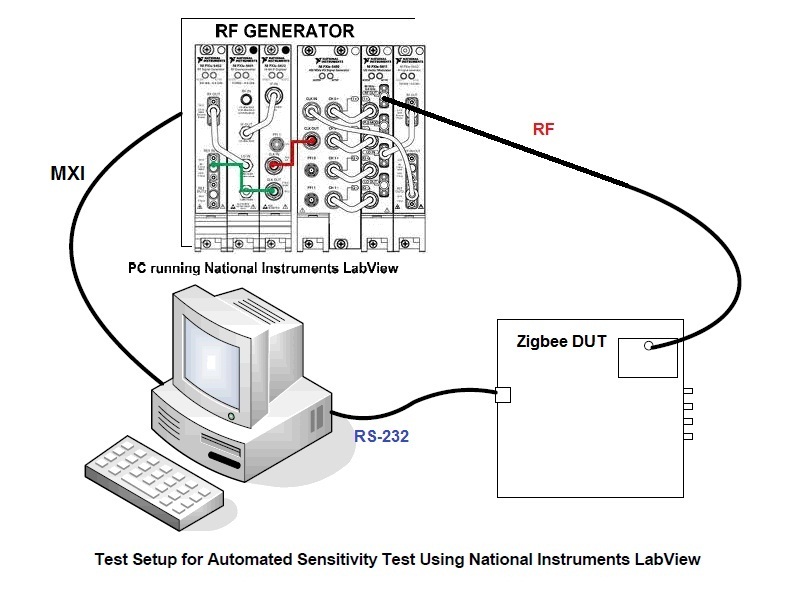 Procedure for Receiver Sensitivity Testing (PER) is briefly mentioned below..
1. Program the Zigbee DUT with the wanted RF configuration (RF frequency,modulation format, deviation, data rate etc. ), and put the device in RX. 2. Configure the niWPAN 2450 Receiver Testing Example (RFSG) with the corresponding RF settings. 3. Use a DATA Frame (containing preamble, sync word, and payload) for transmission. 4. Read the RXFIFO content and compare it to the known bit sequence bit for bit. Since each bit is checked a CRC check is redundant . 5. Repeat steps 3 and 4 for a sufficient number of packets (At least 100 packets is needed to give a reliable PER figure). 6. Adjust RF level from the generator and start from step 3 again. This is repeated until the wanted PER level is found. 8. Log the final result in an output file. As mentioned in the IEEE 802.15.4-2003 Standard, the following Receiver Tests are supported.